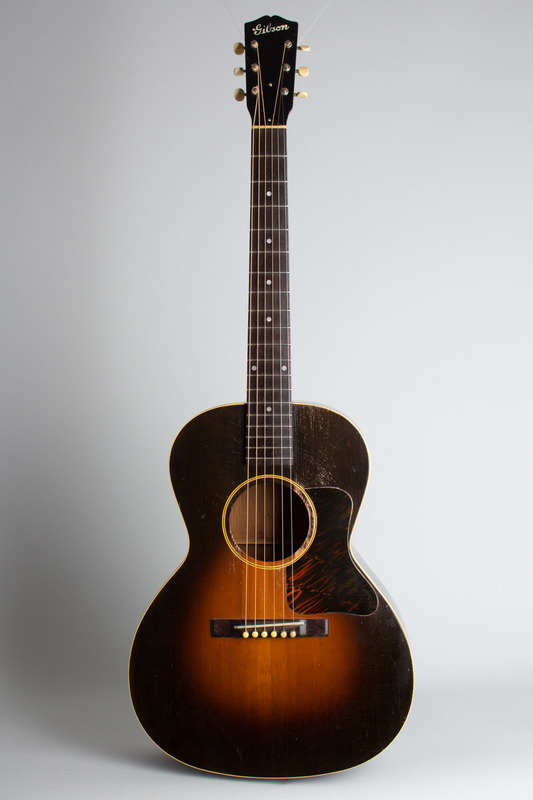 Gibson L-00 Model Flat Top Acoustic Guitar (1934), made in Kalamazoo, Michigan, serial # 303-14 (FON), sunburst top, dark back and sides finish, mahogany back, sides and neck, spruce top, rosewood fingerboard, original black chipboard case. 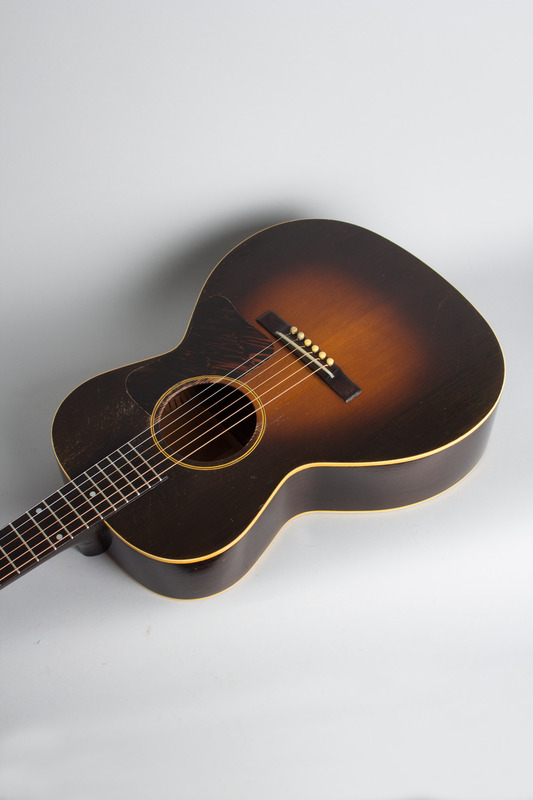 The L-00 has always remained one of Gibson's most popular Depression era flat-top guitars, then and now. While this model was at the bottom of the flat top line in the early/mid-1930's it offered a great value in sound. This example was built in 1934 (when the list price was $27.50, without the case) and while it shows some play wear has survived in better condition than many. 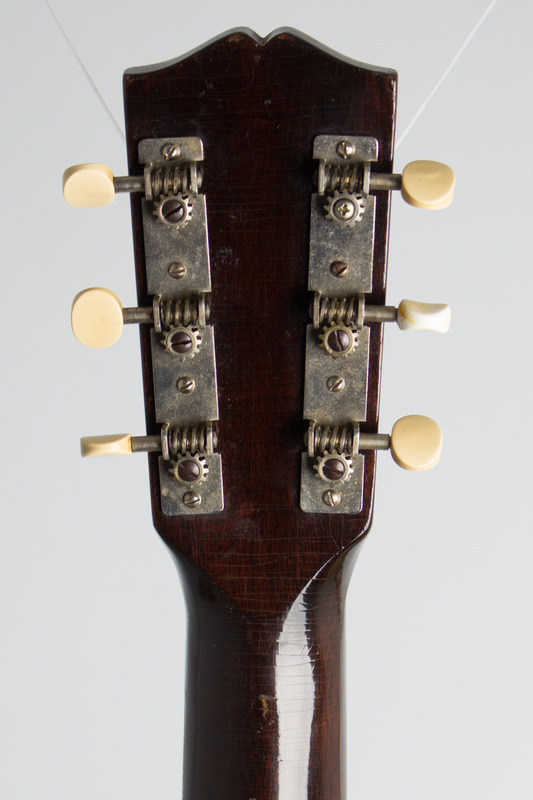 The top finish is a deep sunburst with a fairly small center, typical of the earlier '30's guitars. 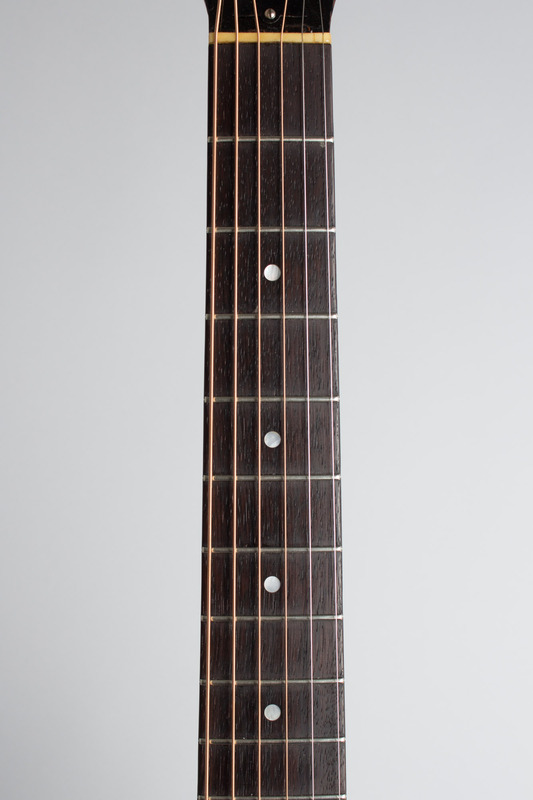 There is single ply white celluloid binding around the top edge, which is also ornamented with a "firestripe" tortoise celluloid pickguard and a three-ply soundhole ring. 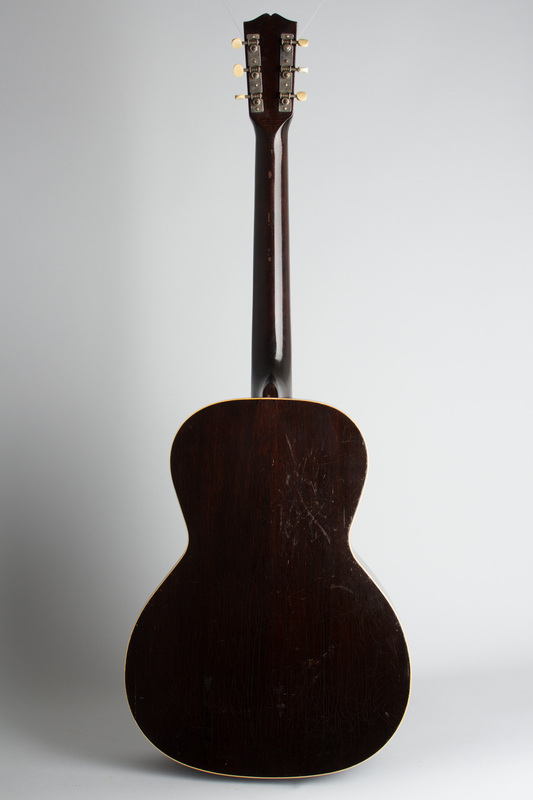 The back and sides are finished in dark mahogany, as is the fairly shallow "V" profile neck (softer on the spine than some examples) with an unbound rosewood fingerboard. 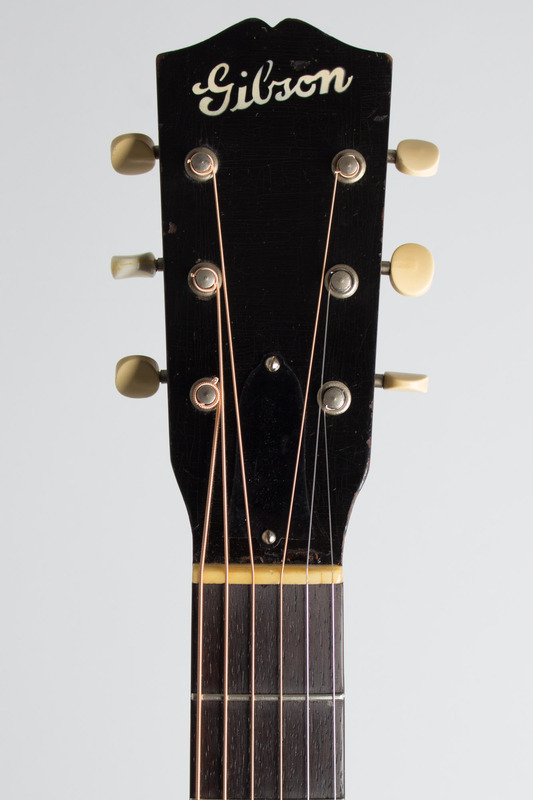 The headstock carries a white stenciled "Gibson" logo and simple openback tuner strips. 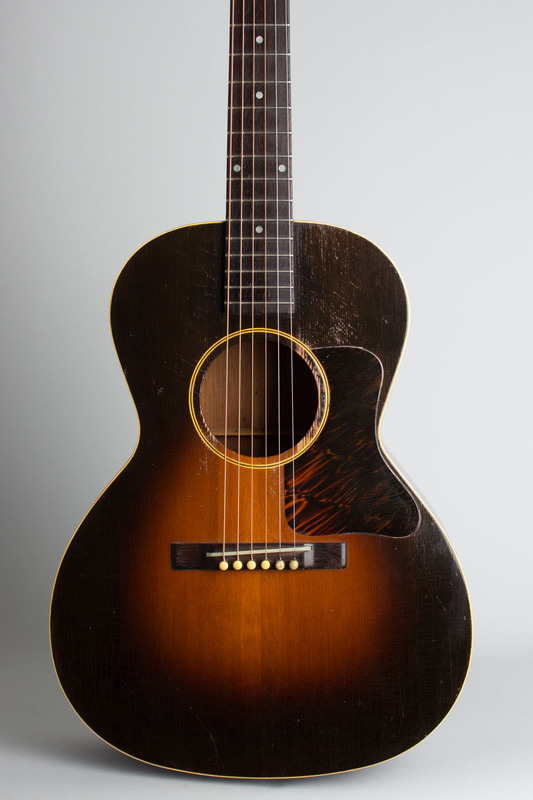 This model was a working-class standard of the day, a professional grade guitar at a price affordable to blues players, Hillbilly string bands and many other itinerant musicians as well as Gibson's intended student customers. Each one of these guitars has its own character and this one is quite even sounding both finger- and flat picked with a chunky midrange and a substantial helping of high end. Overall length is 39 3/4 in. (101 cm. ), 14 3/4 in. (37.5 cm.) wide at lower bout, and 4 3/8 in. (11.1 cm.) in depth at side, taken at the end block. Scale length is 24 3/4 in. (629 mm.). Width of nut is 1 3/4 in. (44 mm.). This L-00 is a bit worn in but all original and an excellent player, with a recent neckset and refret bring it up to optimum standards. 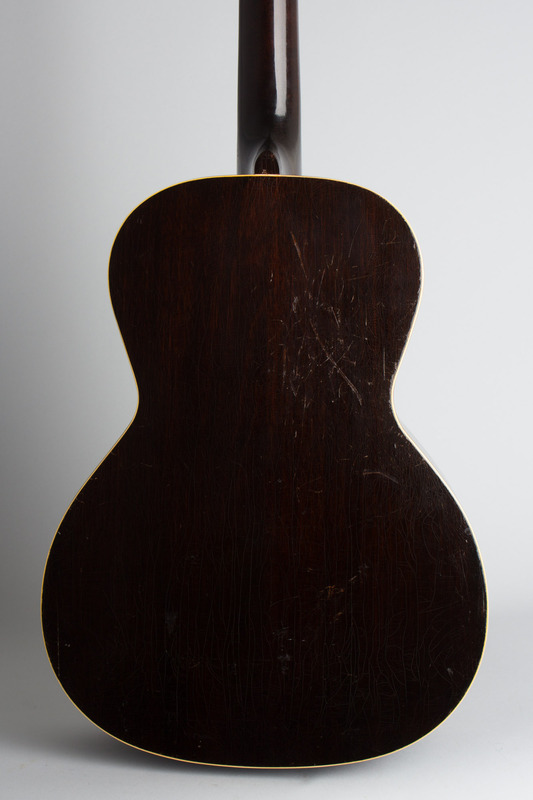 The finish shows some typical wear-pick marks mostly on the edge of the soundhole, with other smaller dings and dents to the top and some visible scrapes to the back. The back of the neck has a few chips to the finish along the spine but is mostly pretty clean. Overall this is in cleaner shape than many of these but still shows the signs of a long active life. There are no cracks to the top, the only real area of old damage is a spot on the lower treble bout side that has a repaired impact area about 1" wide and 2" long. This is solidly sealed up but still visible. This featherweight guitar has a nice even ring to the sound, and plays equally well fingerstyle or with a pick. The original chipboard case is still present and relatively functional, of course a newer hardshell can be provided as well. Very Good + Condition.